With their latest release naivsuper Books is entering a new series defined by a new format. This latest publication of books is the first of a new 21 x 21 cm series. This comes after publishing 10 small art books in 14.8 x 14.8 cm, reminiscence to the size of a CD booklet, because music was at the core of their origins in publishing. The format has changed, but the concept stays the same – one artist and one theme curated by naivsuper in collaboration with the artist. Not quite a catalog, not quite a book, not a ‘zine, not a magazine either – but rather a gateway drug for collectors, a small book with fantastic pictures, an introduction to a young artist, an affordable little piece of art in itself…. you name it. 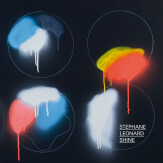 Stephane Leonard´s SHINE contains drawings, collages and paintings from this ongoing series. Leonard’s usual works are developed in series – he archives and categorizes each and every drawing, collecting them in small boxes which he labels with a single word. His overall theme is searching for images filling the gaps that the invisible state of all things imagineable are leaving behind. These things can be out of tune with the human eye or can be just an idea, a thought, a feeling. Or simply the space in between two already defined things, objects, or human beings. Sounds a bit too abstract? Well, most of Stephane´s work is actually quite abstract. Nevertheless this book is giving away some of Stephane´s secrets by including pictures from his found footage archive of “inspirational images” or images from a box simply labeled “I love it”. If asked, Stephane himself calls his work ‘die Kartographie der Zustandsänderungen’ – the cartography of changing of states or simply freezing process in time and space. In SHINE Stephane more specifically explores the so called “aura” of human beings, going as far as taking a look into the human skull and brain. The drawings are oscillating between abstract scribblings and almost anatomic correct investigations. In combination with the photos and found footage material we are invited to take a deeper and more intense look at where his images might be coming from or go on from here. Stephane himself says that he is extremely pleased with the way his drawings appear on the open paper. Even the smallest elements of “dirt” and “scratches” as well as the most subtle little lines are shown on the open paper, and we couldn´t agree with him more. A perfectly executed offset printed book, limited to only 500 copies, available in selected shops around the planet or simply at the naivsuper shop (www.naivsuper.de). Oh, and Stephane asked us to mention the suggested double meaning of the word “Shine” which is the same as the German word “Schein”. But translated in German it has the double meaning also of ‘make believe’.